Bill Viola has a real knack for making imminent doom look a little too inviting. I suppose that is the job of the artist though, to make all aspects of life look captivating and Viola really drives that point home by playing with all those thematic heavy hitters such as birth, death, and the unwrapping of consciousness. Between the name and the cross-like pose the man is hitting in this video, I think it is safe to assume that this work is speaking to Christian iconography. The ascension of Christ is a topic that never seems to go out of fashion in the arts as it has been consistently depicted since the fifth century. Viola’s rendition of the ascension, however, is notably different. Apparently Viola did not get the memo that Christ ascended up to heaven, for in this work the man sinks down into the watery depths. Could this be a commentary on our distorted views of heaven or hell or just a sign that Viola didn't pay enough attention in Sunday school? Either way, I can appreciate mixing it up and throwing a wrench into our preconceived notions of religion. Exploring the human condition through religion is one of Viola’s signature moves, and the work that does so arguably constitutes of some of the strongest pieces in his portfolio. Not that this is anything new, religious iconography has been a cornerstone of the arts since antiquity, but Viola undoubtedly approaches the topic in an unusual fashion. His signature slow motion water worlds conjure up fantastical feelings of euphoria and fear. Then again, isn't that what religion is all about? A practicing Buddhist, Viola is fascinated by the connection between humans and their environment and how this is influenced by time. His meditation practice surely informs his work as well, for Viola has a way of making chaos seem calm and serene. I mean, in this video I am pretty sure we are watching a man sink to Davey Jones locker yet I feel no remorse about it! I would like to think that is due to Viola’s tranquil composition and not me being a sociopath...hopefully. The distortive properties of water give way to an altered consciousness and spiritual awakening, or so one could speculate. Given Viola’s fascination with the human condition, this could explain his complete obsession with water. Some may see Viola as sort of one-trick pony given his work pretty much always includes the slow motion flow of water, but a little insight into his childhood really explains a lot. At six years old he fell into a lake and nearly drowned. Given the traumatizing nature of that experience, I would say Viola has earned the right to fixate on water for the rest of his career. It is safe to say given his immense success; the public is okay with this, too. Part of a series of three, this particular work was donated by a couple celebrating their ten-year wedding anniversary. I hope someday I have a partner who loves me enough to buy artwork just to give it away. "Ascension." Encyclopædia Britannica. Accessed May 24, 2017. https://www.britannica.com/topic/Ascension-Christianity. "Bill Viola." INFRAME.TV. Accessed May 24, 2017. http://www.inframe.tv/people/bill-viola.html?v=102. 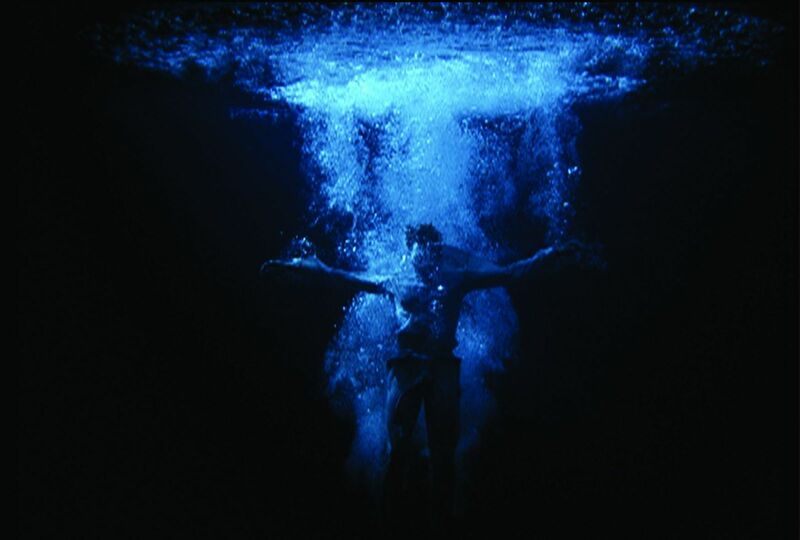 "Bill Viola, Ascension." Museum of Fine Arts, Houston. Accessed May 24, 2017. https://www.mfah.org/art/detail/51785.